2. 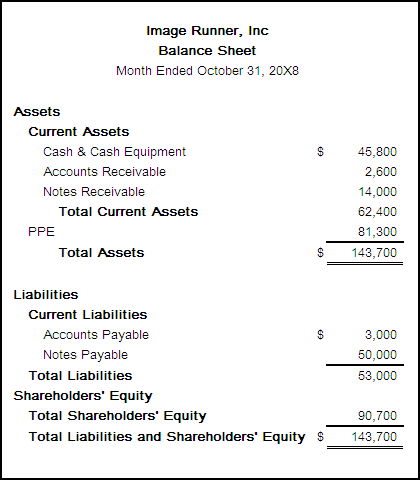 The Image Runner is actually in a better financial position. The erroneous balance sheet report shows the total shareholders’ equity of $65,600 but it should be $90,700. A higher shareholders’ equity shows a better financial position. 3. Because we don’t know the current value of the equipment so we couldn’t put it in the balance sheet. Utilities expense, advertising expense, salary expense and interest expense should be in an income statement. Posted by cyesuta on Tuesday, January 13th, 2009, at 14:56, and filed under Accounting Homework.